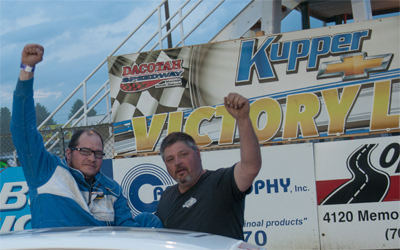 Dacotah Speedway hosted the second night of the fifth annual Dakota Legends Tour on Friday, June 5th. It was a perfect evening for racing for fans and drivers who traveled as far as Texas and Indiana come to race on the high banks of the Dacotah Speedway. Racing in his first Dakota Legends Tour, Nelson Stewart, father of two-time NASCAR champion, Tony Stewart, was also in the house. The evening k icked off with a 10 lap IMCA Sport Compact feature. When the green flag waved, it was a three car battle for the lead between Kody Stoxen, Stan Thompson and Josh Roehrich. Thompson got loose in turn four and drifted up the track and into Stoxen, costing both drivers valuable track position. Race leader Roehrich distanced himself from the field while Jason Berg raced Chase Schlafmann for second. Berg got off the track going down the backstretch, dropping from second to fifth. Berg quic kly passed Brandon Anderson for fourth, bringing Chance Seelye with him. However, Berg got off the backstretch again but managed to hang on to fifth. Seeyle, who struggled in his heat race, found speed in the feature and quickly chased down third place, Kody Stoxen. With five laps to go, Seelye completed the pass on Stoxen for third but Stoxen did not give up and continued to race hard. As they crossed the Open Road Honda finish line, Seelye held off Stoxen to finish third. Jason Berg rounded out the top five while Josh Roehrich led all 10 laps to win his second feature victory over Chase Schlafmann. Dylan Thomas grabbed the lead from pole sitter James Weber in the Hobby Stock feature. Thomas's lead was short lived as a fast Jeremy Engelhardt took the lead on lap two. On the following lap, Thomas had a run on Engelhardt but made contact in turn four, slowing both cars as the rest of the field quickly caught the leaders. It was a log jam going into turn one as several drivers had no where to go and wrecked on the frontstretch. Engelhardt was charged with the caution and had to restart tail-end. Josh Anderson took the lead on the restart but Engelhardt made his way back to the front in a hurry, cracking the top five by lap four. Engelhardt passed Thomas for fourth and quickly reeled in Jaren Wald and Wyatt Rath-Wald as they battled for second. Lurking in fourth, Engelhardt watched as Wald and Rath-Wald raced side by side for second before taking it three wide. Engelhardt shuffled into second place with two laps to go and ran down the leader, Anderson. 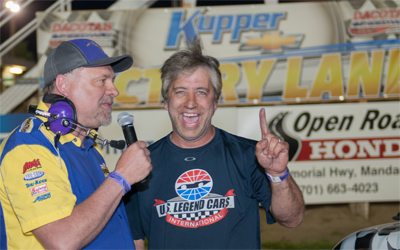 In a last lap effort, Engelhardt threw the car hard into turn four but Anderson held on to win his first feature at the Dacotah Speedway. Jaren Wald edged his cousin, Wyatt Rath-Wald at the finish line to finish third while Josh Roehrich quietly finished fifth. Pole sitter Scott Gartner led early in the WISSOTA Street Stock feature. Behind Gartner, it was three wide for second between Kelly Hoerner, John Weber and Dustin Frank. They raced three wide for several laps before Frank shuffled into second and challenged Gartner for the lead. It soon became a four car battle for the lead as Hoerner and Jeremy Schmidt took it four wide. Gartner and Frank got the short end of the deal as they made contact, dropping both cars from racing for the lead to outside the top 10. Schmidt inherited the lead and started to pull away from the field. A caution with six laps to go reset the field, putting Hoerner and Brock Beeter on Schmidt's rear bumper. On the restart, Eric Harpole passed Beeter for third but Harpole got loose with four laps to go, allowing Shawn Volk to slip by for the position. Harpole fell into the clutches of fifth place Zach Frederick. Frederick and Harpole raced hard for fifth, flip flopping position on the track. As the checkered flag waved, Harpole held off Frederick for fifth place. 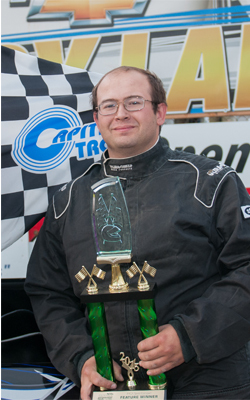 Shawn Volk, who started 17th, finished third behind second place Kelly Hoerner and feature winner Jeremy Schmidt. Kirk Wojahn and Dan Aune led the field to the green flag in the IMCA Modified feature. Aune led the first three laps before he got loose in turn four, allowing Spencer Wilson and Bradley Steffes to catch and pass Aune for first and second. A caution on lap five regrouped the field and on the restart, Shawn Strand passed Steffes for second. Strand continued his march to the front by taking the lead from Wilson on lap seven. As Strand started to pull away from the field, Steffes had his hands full with a strong Marlyn Seidler. They raced side by side for several laps before Seidler completed the pass on lap nine. Seidler quickly caught and passed Wilson for second a few laps later. 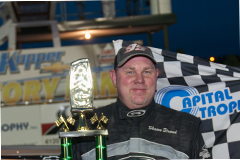 Although lapped traffic did not slow leader Strand any, it helped Jason Grimes catch Wilson and Seidler. Grimes picked off Wilson with seven to go and was all over Seidler's rear bumper. Seidler's low line around the track gave him the momentum off the corners to hold off Grimes at the finish line to finish second. Spencer Wilson finished fourth as Dan Aune passed Steffes with three laps to go to retake fifth. 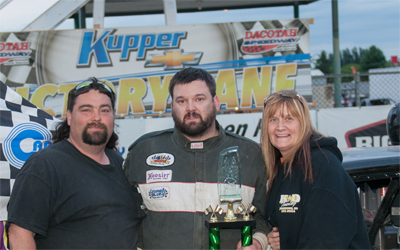 Shawn Strand extended his points lead as he went on to win his first feature victory of the season. In the final feature of the night, pole sitter Nate Keena held onto his lead in the INEX Legends feature. Keena had his hands full as he tried to hold off Shane Williams and Tim Brockhouse. It was a three car battle for the lead before Brockhouse shuffled into first place on lap three. Keena rallied back and retook the lead from Brockhouse a few laps later. Keena and Brockhouse continued to race hard for first while Williams and Donavin Wiest raced side by side for third. Brockhouse slipped by Keena for the lead just before a caution on lap eight reset the field. Keena and Wiest raced side by side for second on the restart before Wiest powered by, bringing Williams with him. Keena started to fade as the laps wound down, losing spots to Tom Wagner, Paul Morman and Troy Hoff. With only five laps to go, Wiest and Williams battled hard for second. They raced side by side for position but Williams would edge Wiest at the finish. Paul Morman held off Drew Papke and Troy Hoff to finish fourth while an uncontested Tim Brockhouse picked up the feature victory. 6:30pm – HOT LAPS FOR LATE MODEL DRIVERS ONLY. For more information visit us online at www.dacotahspeedway.net or visit our YouTube channel. Fans can also follow us on the following social media sites: Facebook, Instragram and Twitter. And for instant updates text the word “speedway” to 20691.